For many in Indian Country, fall can be a bitter reminder of both the atrocities of the past and their modern day distortion in the national narrative. It’s a lousy time of year, starting with Columbus Day, which honors a man who spelled doom for millions of Indigenous people, and moving through Halloween, when Native-themed costumes mock innumerable cultures. 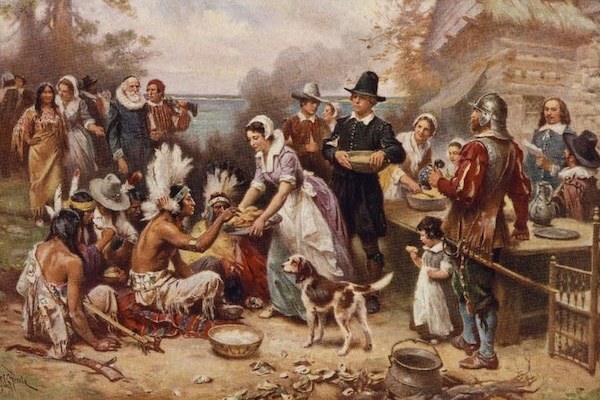 There is no worse reminder of the North American genocide, though, than Thanksgiving. Too often, journalists miss the mark when commenting on Thanksgiving’s place among Native communities. However, more and more news organizations are giving careful thought to coverage of Indigenous peoples. This year, NPR’s Code Switch gave a platform to news assistant Savannah Mahe, a citizen of the Mashpee Wampanoag Tribal Nation, whose members first encountered and were later enslaved by English colonists. Mahe’s piece touches on a wide range of issues linked to a distorted history, and a holiday that people think somehow honors Native Americans. “Wish any of us a ‘Happy Thanksgiving’ today, and we’re liable to cut you off and say, ‘You mean the National Day of Mourning?’” Mahe writes. 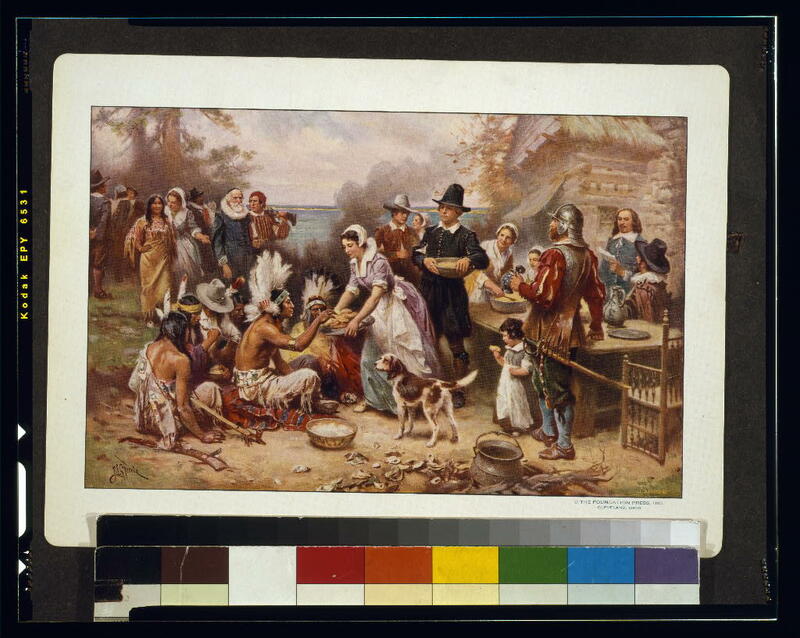 A painting from 1932 entitled "The first Thanksgiving, 1621" depicts a quaint version of relations between English settlers and Native Americans. It’s no surprise that a program like Code Switch, which does excellent, provocative coverage of race and identity, would address Thanksgiving by raising up a Native voice. More surprising was to see The New York Times, which often falters in Indian Country, give not one but four Native writers a chance to weigh in on the holiday. Those small steps forward for Native representation were undercut just days later by the president of the United States. Addressing (and purportedly honoring) a group of Navajo Code Talkers and veterans of World War II, President Donald Trump thought it a good moment to take another jab at Sen. Elizabeth Warren, D-Mass., by disparaging her as “Pocahontas.” This was meant as a wry critique of the outspoken senator, who was raised in Oklahoma and has made unfounded claims of Cherokee ancestry, based on the “high cheek-bones” of her grandfather. Such exchanges demonstrate how complicated and pervasive slights toward Native Americans can be. Yes, Warren ought to do more to take responsibility for her past comments. And, no, the president ought not use a racial slur to disparage a political opponent. More than that, though, we all need to work harder to honor the true history of Pocahontas and other Indigenous peoples kidnapped, raped or otherwise forced to assimilate into Anglo-European culture. In fact, the true story of Pocahontas is much more complicated than a Disney feature, and is tangentially related to Thanksgiving. The daughter of an Algonquian-affiliated chief named Wahunsenacawh, (called Powhatan by the English), a teenage Pocahontas knew John Smith and other early colonists from their Jamestown settlement — which only survived its first year thanks to a supply of corn brought by the tribe. After that first year, when the English demanded more than the tribe could provide, the relationship turned acrimonious, with Smith undertaking an armed campaign to take food from villages around Jamestown and Wahunsenacawh trying to starve the colonists out, according to The American West: A New Interpretive History. Wahunsenacawh later told Smith he understood “your coming is not for trade, but to invade my people and possess my country.” In the winter of 1609-10, without the aid of the tribe, the starving colonists turned to cannibalism. Pocahontas never married Smith (who exaggerated their relationship in his memoirs), but rather, years later, another Jamestown colonist, a tobacco cropper named John Rolfe. She took the Christian name Rebecca and died of an illness on a trip to England. This history is hardly ever acknowledged. Instead, the image and idea of Pocahontas is of a scantily clad cartoon, singing of the colors of the wind. Cherokee playwright and attorney Mary Katherine Nagle notes not only this marginalization of Native peoples and their histories, but the underlying sexualization of Native women so routinely tolerated today. She cites as an example rapper Nicki Minaj’s recent promotion of a sexualized cartoon depiction of Pocahontas on social media. The sexualization of Native women comes at a high price. Today, more than 80 percent of Native women experience violence in their lifetime, according to the U.S. Department of Justice. More than one in three Native women are raped in their lifetime, more than twice the national average. So when the leader of the free world uses that sexualized depiciton to insult a rival, it’s troublesome to say the least. Better, then, to tell more contextualized stories that avoid stereotypes and dispel myths. I, for one, would be thankful for that.